The HTC One mini 2 comes in a familiar retail box and the peripherals include an A/C adapter (rated 1A, as opposed to the 1.5A unit of the HTC One M8), a microUSB cable and the standard HTC headphones with a microphone and extra ear buds (nicely accented in red just like the original HTC One mini). The HTC One mini 2 measures 137.4 x 65 x 10.6mm, which is about the size of the original HTC One. With a pair of stereo speakers either side of the 4.5" display, the One mini 2 is taller than most phones with the same screen diagonal. It tips the scales at 137g - a difference you'll notice if you've handled the 122g HTC One mini. By comparison, the Samsung Galaxy S4 mini is more compact and weighs a good 30g less - a bigger difference than the 0.2" of display diagonal warrant. The Sony Xperia Z1 Compact has a 4.3" display too and is 10mm shorter. Built of aluminum and glass, it weighs the same. The heavier and thicker Motorola Moto G is shorter too, while offering the same screen size. Even the Motorola Moto X which, has a 4.7" screen, is shorter, slimmer and lighter. HTC made the move to on-screen buttons this generation, but this didn't help the height problem. None of the above has a meaningful response to those front-facing speakers, of course. This is a compact replica of the HTC One (M8) and proud of it. At first glance you'd be hard pressed to find a difference between the two. The paintjobs are the same, too: Gunmetal Gray (the one we have), Glacial Silver and Amber Gold. The gapless unibody of the HTC One mini 2 was molded from aluminum with minimal use of matte plastic. Edges are comfortably rounded for a great feel in hand. The screen is enclosed within a subtle plastic frame which extends over to the rear to visually divide the battery cover the way the screen and speakers split the front. The thin strips of plastic accommodate the antennae to make sure aluminum doesn't stand in the way of quality reception. The cold touch of brushed aluminum against your palm reinforces the premium feel of the handset. The mini 2 is just over a millimeter thicker than the previous model, but the Li-Po battery grew from 1,800mAh to 2,100mAh. This time around, you needn't worry about storage either - the HTC One mini 2's 16 gigs worth of built-in storage can be easily topped with a microSD card. The slot is right below the nanoSIM compartment. The previous generation used the larger microSIM variety. The exterior differences between the HTC One (M8) and the HTC One mini 2 are quite subtle - the compact version has a little more plastic along the sides and the volume rocker doesn't quite match the brushed metal look of the rest of the phone. Around back, the absence of the dual lens setup and the two-tone LED flash of the One M8 are the giveaways that you are looking at the One mini 2 but other than that, the shape and finish of the two handsets is identical. The One M8's IR blaster is not to be found on the One Mini 2 - the upside is, the mini has the 3.5mm jack at the top, which is the position we prefer. In any case, we're looking at an extremely well-made device, with premium written all over it. The Sony Xperia Z1 Compact is probably the only smartphone that comes close in terms of build and finish. The HTC One mini 2 mirrors the controls of the bigger HTC One (M8). The front is occupied by the 4.5" 720p display, which now accommodates the Home, Recent Apps and Back buttons - a better solution than the two-capacitive-button setup of the previous generation, but one that should've reduced height too. Anyway, one thing that has thankfully not changed is the front-facing speakers, located on each side of the display and hidden under precision-drilled micro holes. The pair doesn't have Beats anymore, but each has its own amplifier instead - just like on the One M8. Above the screen, an ambient light sensor, proximity sensor and a wide-angle 5MP front-facing camera are either side of the earpiece (within the speaker grille). The main microphone is placed under the bottom speaker grille. The nanoSIM slot is on the left-hand side, while the microSD card on the right - a dedicated tool supplied in the retail box is used to eject the two trays. The volume rocker is placed under the microSD card slot on the right side. 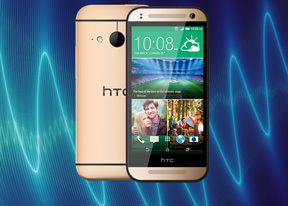 With no IR blaster on the HTC One mini 2, the top side features only the power button and the 3.5mm headphone jack. Another feature missing on the HTC One mini 2, that the bigger HTC One (M8) has, is the ability to swipe-unlock the device even from sleep. The bottom features the microUSB 2.0 port only. Another place where the HTC One mini 2 differs significantly from its bigger sibling is the back. There's no Duo Camera setup here and no two-tone LED flash. What you do get is a 13MP camera with a single LED flash. The noise-reducing microphone is next to the LED. Handling the HTC One mini 2 is a pleasure. The phone is heavier than its predecessor but with a decisively more premium feel. What raises question is the size, especially the height. So much so that it puts the very name in doubt - the stereo speakers being the only saving grace.